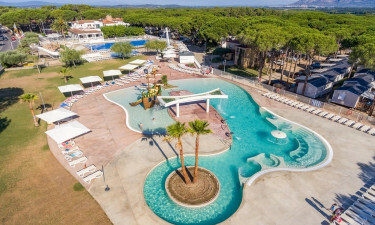 Found within the tranquil confines of Costa Brava, Cypsela Resort is a luxury camping site perfect for those who hope to experience relaxation alongside fun in the sun. To learn more or to address any additional questions, please contact LUX-camp. 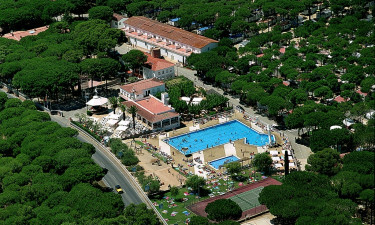 Why Should I Select Cypsela Resort for the Next Camping Holiday? Agreeable temperatures throughout the year. An impressive 902 pitches equipped with mobile homes. Only a short distance away from the Mediterranean Sea. A holiday camping site perfect for the maritime enthusiast. Costa Brava is a region located in Northeastern Spain and the temperatures here are known to be quite moderate throughout most of the year. Due to the proximity of this holiday camping site to the warm waters of the Mediterranean, the winters tend to be rather mild. Summers are much more agreeable when compared to other locations such as Costa del Sol or Tarragona and the temperatures rarely rise above 30ºC. So, families can enjoy the climate here regardless of what time they plan on arriving at. 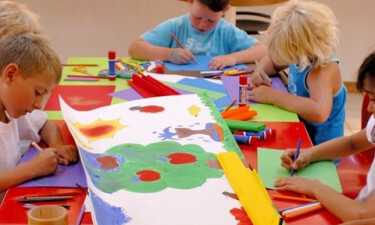 Cypsela Resort offers a number of activities directly within the camp. Some of these will include outdoor pool tennis, table tennis and miniature golf. Those who have arrived with a vehicle and wish to venture out into the local community can partake in other amenities such as sailing, surfing, bicycle hire, golf and a luxury sauna. Venturing further abroad will allow the entire family to experience relaxing thermal baths (45 kilometres from Cypsela Resort). This luxury camping resort is able to handle even the most demanding of expectations thanks to the modern facilities that are provided. There are 184 individual washing cubicles as well as baby changing rooms for those who are planning on bringing infants along during their next camping holiday. Access to washing machines and tumble dryers is included as part of the standard package, as is Internet access, power supplies to all mobile homes and a waste disposal facility. There are several opportunities to grab a quick bite while experiencing camping in luxury. 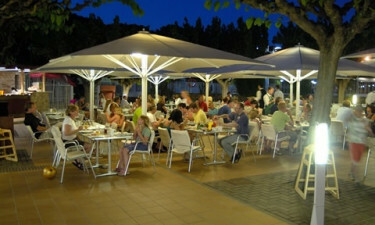 Their restaurant boasts an eclectic mix of both international and Mediterranean cuisine as well as a menu for children. There is also a snack bar for a tasty plate of tapas (finger food) or a quick drink before heading to the pool or out to the beach. All are known for their attentive service and employees will be able to communicate in English. A large supermarket will supply everyday essentials such as fresh produce, toiletries and camping equipment. A miniature market and a bakery are also found within this luxury camping site; perfect for those looking for freshly baked bread or the latest international newspaper. Souvenirs can likewise be purchased here and there is even a bookshop should a guest wish to catch up on his or her reading while enjoying this camping holiday. Feel free to contact LUX-camp for more details.